These are top down with a flap and gusset heel, which can be easily adapted for a higher instep and comes in three sizes. 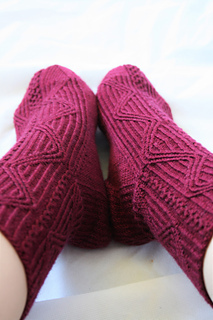 The socks are designed to be worn with 1.5”/3-4cm negative ease, as the stitch pattern is very stretchy. The pattern contains written and charted instructions, whichever you prefer to work from. The digital version also contains bookmarks at strategic points to help you navigate the pattern and a diagram is included helping you to visualise what is going on. This pattern is very yarn intensive and yardage is dependent on foot size. You may need more than 400 yards for the 9” size, and almost certainly for the 10” size.